This is some sad news. Julian Assange, founder of the whistleblower website WikiLeaks, was arrested by the British police "on behalf of the US authorities", the British police said. That happened at the embassy of Ecuador in London, where he was hiding for years. He has been taken to a police station, and will then have to appear before the Westminster court as soon as possible. Assange has been staying at the Ecuadorian embassy in London since June 2012. He was granted asylum after Sweden issued a European arrest warrant against him on the basis of a complaint of sexual abuse. But in the past year the relationships between Assange and Ecuador have precluded. At the beginning of this month, Ecuadorian President Lenin Moreno had repeatedly accused Assange of violating his asylum conditions. WikiLeaks now reports on Twitter that Ecuador "put an end to the political asylum for Assange" illegally "and" in violation of international law ". The Ecuadorian ambassador has let the police into the embassy and Assange was immediately arrested, still wikiLeaks. 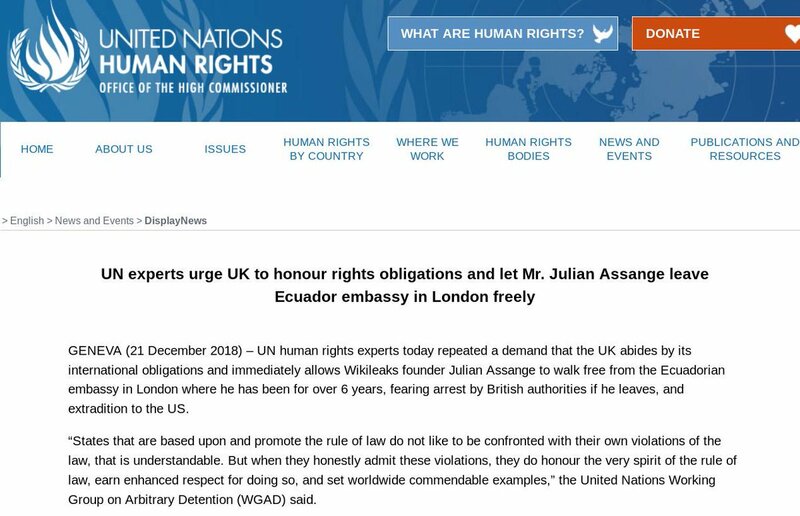 President Moreno has stated that he has been assured by the British authorities that Assange will not be extradited by the British to a country where he can receive the death penalty. Why is it I don't believe this? When he goes to the US he risks a death sentence or at least life sentence what would even be worse. If he is not extradited, how long would it take to hear the news he died in a tragical accident or commited suicide. The United Nations formally ruled his detention to be arbitrary, a violation of human rights. They have repeatedly issued statements calling for him to walk free--including very recently. Exchange QuadrigaCX is soon bankrupt. Almost $200 million missing! Russia Wants to Cut Itself Off From the Global Internet. Portal Network solves the problem of user adoption, complexity, human error and lack of interoperability by deploying BNS standard across multiple blockchain protocols. BNS (Blockchain Name System) is the protocol on the internet that turns human-readable decentralized website names, Such as “yourwebsite.bch” or “mywebsite.eth” into addresses understandable by decentralized network machines. MUMEI is a platform with a series of tools that empowers both technical & non-technical users to easily interact with and deploy ÐWebs or ÐApps. KAIZEN empowers users to learn, build, deploy, and manage decentralized applications or decentralized web services with their native languages, the participation of hackathons, CLI, frameworks, and monitoring systems. I don't think that Bitcoin is going to replace the current system. It's more likely to be a smarter coin like Ada (Cardano), Stellar or Ethereum. Still Bitcoin keeps going on and on even we have doomed it dead many times. "Bitcoin (BTC) should usurp current global payment systems within the decade, a new report from software startup DataLight concluded on April 2. The basis for that assumption lies in the already far greater number of nodes, lower fees and average transaction size, among other technical factors. Bitcoin, for example, has around 10,000 active nodes, compared with Visa’s 119 data centers, MasterCard’s 98 and PayPal’s 51. At the same time, Bitcoin has fewer users, in line with its only ten-year period on the market; Visa and MasterCard debuted in the 1950s and 60s, while PayPal followed in 1998. There are currently around 25 million Bitcoin wallets, while the number of Visa and MasterCard credit and debit cards in circulation has reached 5.3 billion, the report notes. To DataLight, however, these are signs of a work in progress. In the near future, advances will make Bitcoin an attractive proposition for mainstream consumers, taking it out of its technical niche environment, according to the report. Specifically, while the cryptocurrency can only handle around seven transactions per second at present compared to Visa’s 65,000, scaling solutions — principally the Lightning Network — have more than enough time to transform Bitcoin’s utility, DataLight writes. As Cointelegraph reported, last month saw other research sources eye 2020’s block reward halving event as a watershed moment for enthusiasm around Bitcoin. Its price, they argued, could begin reacting a year in advance, in June this year. The ten-year timeframe meanwhile echoes similar words from Twitter CEO Jack Dorsey, who reiterated his belief in February that Bitcoin would become a form of global internet currency by 2028." "Bitcoin (BTC) analyst Tone Vays said that the recent cryptocurrency market surge may have no specific catalyst, and that lower prices could still be in the cards in an interview with Cointelegraph on April 2. Speaking about a possible driver of Bitcoin’s spike on the night of April 2, Vays said that there is not always a trigger, arguing that it could be just speculation and that “Bitcoin is no different than any other asset.”"
What about the other coins like Ripple, Ethereum and Cardano? Could the many good Ripple stories drive the market up? I don't like centralized exchanges, but this is about the coin. It could be an interesting investment opportunity. Binance Coin (BNB) has already had an incredible start to 2019, increasing from $6 to almost $20 in just a few months. This type of return hasn’t been seen for a very long time in the crypto space. BNB currently sits within the top 10 cryptocurrencies by market cap, and has a very high volume due to Binance pushing the use of their native token. BNB has a total supply of 200 Million and is actually an ERC-20 Token - meaning it runs on the Ethereum Blockchain - and is compatible with MyEtherWallet and all other ERC-20 Token wallets. BNB is Binance’s native token, and performs many functions on the exchange and throughout the ecosystem. Binance promotes using their native token by offering substantially discounted trading fees when using BNB. This alone will shift a proportion of traders and investors to choose BNB as their currency pair instead of Bitcoin or Ethereum. As Binance controls a significant amount of volume, they have a huge audience that can (and will) use BNB to trade. Binance have very cleverly (and recently) introduced their launchpad ICO platform where users can invest directly in vetted ICOs on Binance. Binance have changed the rules to a lottery based system where users will be randomly selected to participate in the ICO’s, but there’s a catch… they have to own BNB. Users can gain up to 5 tickets by holding a certain amount of BNB. WARNING: Due to the nature of this lottery based ICO, expect volatility in the price near the time of the ICOs. Why could this be a good opportunity? In other words, the supply is constantly decreasing and will stop at 100M. Binance is the most popular exchange, and has positioned itself to be so for the foreseeable future. As the overall market cap increases, users on the platform will increase in parallel - meaning BNB will naturally have a higher demand (for the reduced fees). As the market increases, demands for ICOs will increase in parallel - meaning the demand for Binances launch pad will increase. As the market cap rises, Binances profits will increase (more users, more volume etc). As the supply dwindles down to 100M, the economics of supply vs demand will increase - meaning people will FOMO into BNB. Rising tide… even without the above, BNB will increase with the overall market cap. But the above reasons are why I believe it will increase much more than average. So a discussion is open. PayPal is branching into the blockchain space, hoping to explore its promise of enhanced data privacy and management. The payment giant has made a late contribution to Cambridge Blockchain’s Series A round alongside Ebay founder Pierre Omidyar’s investment firms, and is planning to pilot the startup’s product, helping users control their personal data using shared ledgers. “We have a number of exploratory initiatives underway with PayPal,” Cambridge Blockchain CEO Matthew Commons told The Block, hinting the backing was part of a wider partnership. “They do a lot of KYC and manage a lot of personal data because of that,” noting the strategic value for the payment firm, which has 267 million active accounts. Commons also explained PayPal had been following its progress for some time, having sponsored a fintech programme it was selected for in Europe. By fall 2018, Cambridge Blockchain had made contact with their corporate venture team. PayPal also recently moved its European headquarters to Luxembourg, where the Massachusetts-based startup is focusing the first roll-out of its distributed identity system. “Data privacy is becoming an increasingly important interest…[and] we’ve gotten most traction [and the highest pay-point] in the European banking market,” Commons noted. Buoyed by $10.5 million in raised capital, the firm is planning on using the blockchain to validate data and store attestations (“like fingerprints or scans”) in cryptographic proofs. The idea is that once one party has stored on the data, they can share that validation with service providers seeking to onboard the customer without granting them access to other personal information. The focus then will strictly be on b2b services, validating data needed to open accounts with banks and other financial institutions. Asked why PayPal waited until the extended Series A, rather than the one that closed in May last year, Commons said it was a matter of gaining confidence. They may be in luck. Cambridge Blockchain is hoping to start operating later this year, having been in the works for four years and now driven by a team of 11 engineers. It’ll also mean more fund-raising at some point. Current time: 2019-04-21, 09:04 PM Powered By MyBB, © 2002-2019 MyBB Group.